Left to right: Emma Woughter, Local Food Connection team member; Patsy Funke-Carter, LFC logistics manager; and Luke Beckwith, 80 Acre Farm. They are working at the Local Food Connection location in Newport, KY, Feb. 7. Emma is weighing out frozen items to pack into coolers, which are then taken by each delivery vehicle in the morning. Luke is bringing in his products for the day to be checked in, and Patsy is checking him in using LFC’s pick lists. 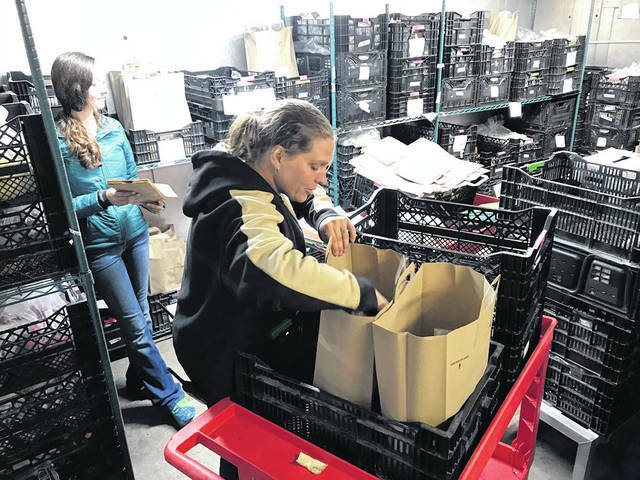 Emma Woughter, Local Food Connection team member (left) and Patsy Funke-Carter, LFC logistics manager (right) packing bags for households to pick up at their respective locations at the Local Food Connection’s walk-in fridge, where food is sorted by client. NEWPORT, KY — Increasing the local food system to make obtaining local food convenient is the main mission of Local Food Connection, a “food hub” organization that connects farmers to a network of active wholesale and retail buyers in the Bluegrass and Ohio Valley. 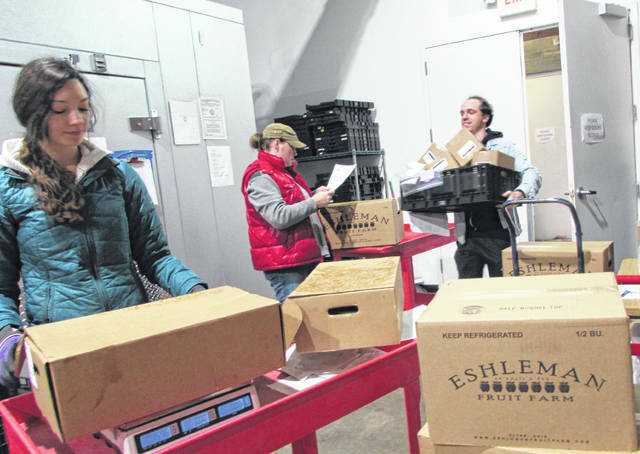 “LFC serves as a logistical middleman between buyers and farmers,” said Alice Chalmers, Local Food Connection (LFC) founder. According to the LFC website, the organization provides “chefs, institutional buyers, employers, and households with a way to source top-quality local food.” LFC is located in The Incubator at 517 W 7th St., Newport, KY, just across the Ohio River from Cincinnati. The organization works with several Ohio producers as far north as Eshleman Fruit Farm in Clyde, OH. Almost all of the apples at LFC come from this location. LFC has three ways of providing product to buyers: week-to-week, standing orders and large volume sales. LFC will work directly with restaurants, which have greens on standing order, and larger institutions that pre-order large volumes. For example, LFC provides product for the whole salad bar at a university. In situations like this, LFC will plan with these institutions and work with farms directly for these types of orders. “[LFC] makes it easy and convenient for the buyer without having to manage a lot of producers,” said Chalmers. “We consider ourselves a food hub.” Buyers can buy from more than 80 farms through LFC, all 100 percent local. Alice Chalmers founded the organization (as the Ohio Valley Food Connection, which is now Local Food Connection) in June 2015 with 14 farms. That Guy’s Family Farm in Clarksville, owned by Guy and Sandy Ashmore, was one those first 14 farms. “[The Ashmores] took a leap of faith with me. I owe a lot to the farmers who started with me,” said Chalmers, adding that Guy and Sandy provided greens when they started. Since 2015 they have grown to 80 farms, 450 whoelsale clients and 2,000 plus households, according to Chalmers. LFC moved $2 million worth of product last year. Chalmers has 9 people on staff, a mix of part-time and full-time employees. Patsy Funke-Carter, LFC logistics manager, said that LFC provides the communication. “We’re talking to the chefs to find out how much we need,” said Carter, adding that they then relay that information to their growers. LFC also offers an online farmers market, where buyers can place orders. Carter grew up in a farm family and then spent 20 years in the restaurant business. She became interested in how food got from the farm to the restaurant when the farm that provided the sprout mix used in the restaurant where she worked suddenly couldn’t provide the mix because a storm destroyed the plants and the greenhouse. “So who do we call? It takes a while to establish the relationships [between the chefs and the growers], but whoever makes up the difference must have consistent quality, and you need the same quality for the high-end chefs [as for] the little corner cafes,” said Carter. When the sprout situation occurred she started thinking, “there’s got to be someone who can help” because the restaurant’s entire menu was based on this product. When her research turned up Chalmers and the LFC, Carter began to volunteer and later on came on as regular staff. Now Carter gets in about 7:30 a.m. on delivery days and spends “a lot of time on the communication.” Some of the farms do as much as $2,000 worth of business a week, while others only send in a few clamshells of herbs or smaller items. According to the LFC website, LFC manages all customer service, ordering and delivery. LFC has five trucks used to deliver projects every week. Some of the producers schedule a group delivery, so a driver will load from their own farm and then pick up from other locations along the way. LFC receives food on Mondays and Thursdays and then ships it out on Tuesdays and Fridays. “Everything is fresh when it gets to clients,” said Chalmers. LFC has two large walk-in coolers, one of which is mostly dedicated to tomatoes during the summer growing season. Their walk-in freezer provides a place for meats and other items as needed. During the winter, they get a lot of storage vegetables, such as winter squash, and bee pollen. For producers interested in becoming part of LFC, email producers.foodconnection@gmail.com or directly fill out this form: https://docs.google.com/forms/d/e/1FAIpQLScmRhgeEpo3J9TyedMNLMWzlgro0_7m5bmPz0Zr7AYliEbIAg/viewform. LFC sponsored an event called Off the Hook at the Newport Aquarium in KY to trigger interest in the Cincinnati area regarding sustainable seafood, according to Carter. LFC will also be participating in the CHCA Food Symposium (www.chca-oh.org/foodsymposium), April 4-5. LFC will have a booth and Chalmers will be speaking. For more information visit: www.localfoodconnection.net.